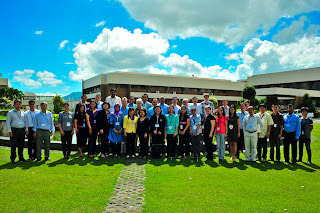 Country partners from six rice bowls in Asia and IRRI scientists met for the inception and planning workshop of the new project Closing Rice Yield Gaps in Asia (CORIGAP) last week (12-13 March) at IRRI Headquarters. CORIGAP aims to generate improved food security and livelihoods for hundreds of thousands of people in Asia, while minimizing the environmental footprint of rice production. It is an initiative under the Irrigated Rice Research Consortium (IRRC) and is funded by the Swiss Agency for Development and Cooperation. In his welcome remarks, Bas Bouman, Global Rice Science Partnership (GRiSP) director, highlighted new components of CORIGAP that will add value to the IRRC’s work, such as modeling tools and software to measure environmental impact. Grant Singleton, CORIGAP coordinator, gave an overview of the project and facilitated discussions on issues such as links with rice breeding programs and the Sustainable Rice Platform. IRRI scientists Ruben Lampayan, Martin Gummert, and Bhagirath Chauhan presented opportunities and new research in their respective fields: water use efficiency and productivity, postharvest, and crop establishment and weed management. Takahiro Sato, cropping systems analyst, introduced the field calculator approach, while soil chemist Sarah Beebout discussed how the project can collect evidence of it being able to reduce ecological footprint of intensive lowland irrigated rice systems. Digna Manzanilla, associate coordinator of the Consortium for Unfavorable Rice Environments, talked about how gender can be mainstreamed into project activities, while value chain specialist Matty Demont discussed business models and pathways to better market models. Communication specialists Trina Mendoza presented communication activities in 2013, while Reianne Quilloy guided participants on using the CORIGAP project Google site. The participants were also given a demonstration on using WebEx for web-based meetings. Partners from Sri Lanka, Indonesia, Myanmar, Vietnam, Thailand, and China developed and presented activity plans for 2013. In his closing remarks, David Johnson, Crop and Environmental Sciences Division head, said that not all national programs of South and Southeast Asia may be involved in CORIGAP, but achieving tremendous impact in these six countries would mean a great deal in improving farmers’ livelihoods, food security and environmental sustainability in Asia.